Bits of My Own: My eyes are bleeding! 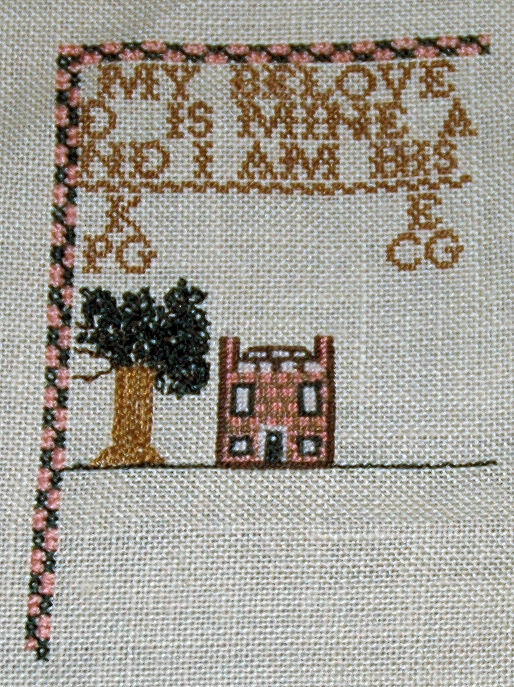 I thought My Beloved, a miniature sampler, would be a quick little stitch. Well it is little but not quick! I still haven't figured out what to do with the date that should go between the initials. The stitches are tiny, tiny, tiny! I just finished Freelove Hazard, which was stitched one over one, however, it was on 25 count linen. There is a big difference between one over one on 25 ct and one over one on 35ct! Not having a lot of fun here! The little brick house measures all of 3/4" X 2/3", smaller than a postage stamp! Stitching the mortar between the bricks nearly killed me! Frankly, I am a little surprised that this is suggested for a beginner. The directions are sketchy, and somewhat incomplete. 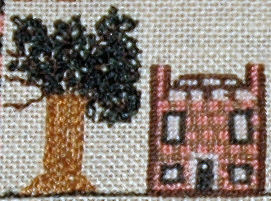 To stitch it as it is shown in the photo, the chart does not work. I finally held the little photo up to the magnifier and counted. A minimum of 4 extra rows have to be added under the initials, to make it work. I think there is probably an error in printing the chart. I guess that is why it says to only do the top and the left of the border until you know if it fits. Also, there are 8 different colors, but the descriptive name didn't really match the colors, so it was difficult to tell what was what. I would think a beginner would find the tiny stitches very difficult. You can't do much in the way of frogging here when the stitching is so tight. I am already looking forward to my next project which will definitely not be one over one! I bet it's challenging, but it sure is pretty - well done so far! Well, it's looking beautiful even if it's difficult. It will be worth the effort in the end, it really will. So tiny! Love it! Oh gosh, one over one - my eyes would not be happy. However, your stitching is looking really cute! Hang in there! It looks wonderful and you are brave. I would not even attempt over one on 36 ct. I'm lucky to go over two on the higher counts! It's so pretty, but yeah--over one--ugh. 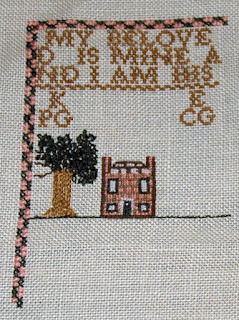 I do it best on high count where I can do a half stitch rather than a complete stitch. Good luck! Looks beautiful, but certainly sounds like hard work. You are doing a wonderful job, but certainly not for a beginner! That's an eye killer for sure! Over 1 on 35?! Oh my aching eyes just thinking about it. You're doing a great job. My Beloved is Finished! Harriot is next! The Traveling Pattern is on the Move!